Two species in other genera, Platycladus and Thujopsis, also have the common name of arborvitae. Platycladus orientalis is known as the Chinese or oriental arborvitae, while Thujopsis dolabrata is known variously as the false arborvite or as Hiba arborvitae. Thuja plicata, the giant arborvitae or Western redcedar (or western red cedar), is a popular timber tree, as is Thuja occidentalis, the Northern white cedar or American arborvitae. Arborvitae are also popular as ornamental trees, particularly given their rapid growth and value for hedges, and various parts have been used for medicinal purposes. These values, along with its ecological importance, reflects the principle of interdependence, whereby species not only advance their own individual purpose of survival and reproduction, but also provide a larger value (for the ecosystem, humans). The name arborvitae comes from the Latin for "tree of life." Arborvitae (Thuja) is a type of conifer. The conifers comprise division Pinophyta (also known as division Coniferae), one of 13 or 14 division-level taxa within the Plant Kingdom (Plantae). They are cone-bearing seed plants (specifically gymnosperms) with vascular tissue. All living conifers are woody plants, the great majority being trees with just a few being shrubs. Typical examples of conifers include cedars, cypresses, firs, junipers, pines, redwoods, spruces, and yews. As gymnosperms, conifers bear their seeds "naked"; not covered by an ovary. The other type of seed plants, the angiosperms (flowering plants), cover their seeds by including them in a true fruit. All living conifers are woody plants, and most are trees, the majority having monopodial growth form (a single, straight trunk with side branches) with strong apical dominance (the truck is dominant over the branches). The Cupressaceae family is notable for including the largest, tallest, and stoutest individual trees in the world, and also the second longest lived species in the world. The largest is the Giant Sequoia (1486.9 m³ trunk volume), the tallest is the Coast Redwood (115.55 meters tall), the stoutest is the Montezuma Cypress or Ahuehuete (11.42 meters in diameter), and the second oldest is the Alerce (3622 years). The leaves of Thuja are evergreen, opposite, and scale-like, except young seedlings, where they are needle-like. The scales are arranged in four rows along the twigs. The branches are flattened and spraylike or fanlike. The male cones are small, inconspicuous, and are located at the tips of the twigs. The female cones start out similarly inconspicuous, but grow to about 1-2 centimeters (cm) long with 6-12 overlapping, thin, leathery scales. The outer bark is thin and scaly. Thuja species can grow three to five feet (1 to 1.5 meters) per year and can obtain heights of nearly 50 feet (15 meters). 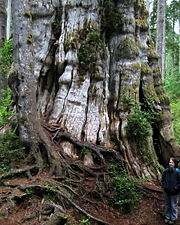 A western redcedar, Thuja plicata, known as the Quinault Lake Redcedar, has an estimated total volume of 500 m³, making it the third largest tree in total volume, after a giant sequoia, Sequoiadendron giganteum (the General Sherman tree), and a coast redwood Sequoia sempervirens (Del Norte Titan tree). A hybrid between T. standishi and T. plicata has been named as the cultivar Thuja "Green Giant." Another very distinct and only distantly related species, formerly treated as Thuja orientalis (oriental or Chinese arborvitae), is now treated in a genus of its own, as Platycladus orientalis. 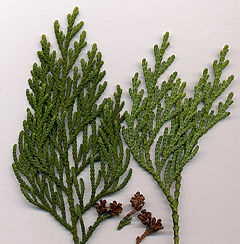 The closest relatives of Thuja are Thujopsis dolabrata, distinct in its thicker foliage and stouter cones, and Tetraclinis articulata, distinct in its quadrangular foliage (not flattened) and cones with four thick, woody scales. Arbovitae have commercial, medicinal, and aesthetic uses. The wood of Thujas is light, soft, durable, and aromatic. It can be easily split and resists decay. The wood has been used for many applications, from making chests that repel moths to shingles. Arbovitae poles are also often used to make fence posts and rails. The wood of the giant arborvitae, Thuja plicata, is commonly used for guitar soundboards. Overall, Thuja plicata is a particularly important timber tree, with the American arborvitae (Thuja occidentalis) also popular. The foliage of Thujas is rich in Vitamin C, and was used by Native Americans and early European explorers as a cure for scurvy. The leaves have been used as a treatment for rheumatism. Oil of arborvitae is often quoted as an herbal remedy to be used topically to aid in the treatment of HPV, genital, or common warts. However, clinical evidence for this action is lacking. Thuja serves as a popular homeopathic remedy, used to treat a variety of psychological and physiological conditions. Arborvitae are popular ornamental trees. As a very fast growing tree, they are particularly popular for the ability to create a natural privacy fence in a very short time. Thuja species are used as food plants by the larvae of some Lepidoptera species including Autumnal Moth, The Engrailed and Juniper Pug. Earle, C. J. 2006. Thuja. Gymnosperm Database. Retrieved December 19, 2007. Farjon, A. 2005. A Monograph of Cupressaceae and Sciadopitys. Kew: Royal Botanic Gardens. ISBN 1842460684. Arboretum de Villardebelle - Photos of cones. This page was last modified on 11 April 2016, at 15:32.